PDEA personnel conducted simultaneous random drug tests and K9 sweeps at bus terminals, airports and seaports nationwide. 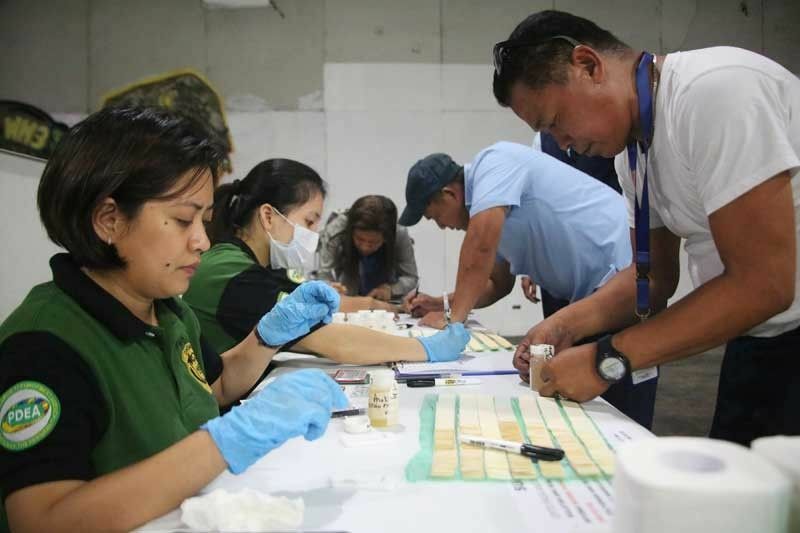 MANILA, Philippines — With passengers heading to the provinces for the Lenten break, the Philippine Drug Enforcement Agency yesterday launched Oplan “Huli” Week as the PDEA subjected public utility vehicle (PUV) drivers to drug testing. A total of 7,729 transport workers underwent drug testing. Of the number, 35 bus drivers, 17 conductors and a dispatcher tested positive for shabu use. Derrick Carreon, spokesman for the PDEA, said the move aims to ensure the safety of commuters whose lives are in the hands of PUV drivers as they embark on pilgrimage to the provinces. “We are coordinating with the Philippine National Police, Land Transportation Franchising and Regulatory Board and Land Transportation Office to ensure the safety of the riding public,” he said. Oplan Huli Week is in accordance with the provisions of Republic Act 10586 or the Anti-Drunk and Drugged Driving Law and RA 9165 or the Comprehensive Dangerous Drugs Act. Carreon said drivers who will test positive for drugs would not be allowed to work by their bus companies until after the confirmatory test results come in. Drivers confirmed to be positive for drug use will be given rehabilitation intervention by the Department of Health, he said. Their driver’s license will be also be suspended. Last month, the PDEA conducted drug testing at bus terminals nationwide. Of the 4,469 PUV drivers who underwent drug tests, 50 tested positive for drug use. Starting tomorrow, the National Capital Region Police Office (NCRPO) will be on full alert to secure the public during the Holy Week. NCRPO director Maj. Gen. Guillermo Eleazar canceled all leaves of police personnel in the metropolis. He said more than 16,500 policemen would be deployed in Metro Manila to secure churches, bus terminals, seaports, airports as well as vital government and private installations. “We should be ready to respond to any emergencies,” Eleazar said. He called on the public to report suspicious persons or baggage to the nearest police station. Accompanied by Quezon City Police District director Brig. Gen. Joselito Esquivel, Eleazar inspected bus terminals in the city yesterday. Eleazar urged security guards to keep bus stations and commuters safe from criminals.